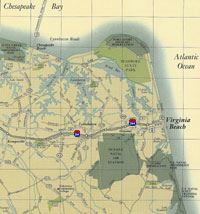 The Broad Bay Sailing Association was formed in 1958 by a group of sailors seeking informal racing on Linkhorn and Broad Bays in Virginia Beach in various types of small boats. To add a little spice to their endeavor they built or purchased a few 11-foot Penguins and 16-foot Comets which along with several Hampton One-Designs were the nucleus of the Broad Bay fleet. The emphasis was on Sunday afternoon racing, monthly meetings at the members’ homes, and numerous cookouts at the Narrows to which they generally sailed from points around Linkhorn and Broad Bays. The social highlight of the year was the annual Awards Presentation and Change of Command Dinner in January of each year, a tradition that is still being followed. In 1961 BBSA joined the Chesapeake Bay Yacht Racing Association and in June of that year held the first Broad Bay Regatta. Until 1964 the members did most of their racing on Sundays on Broad Bay with very few going off to other regattas. 1964 saw the low point of racing on Broad Bay; the Association attempting to hold Sunday afternoon races while more members were hitting the regatta circuit. And then a new breed arrived on the scene, the cruising type boats in the 25-foot range which could get under the bridges out to the Chesapeake. By the late 1960’s the Sunday afternoon racing had disappeared, the One-Design sailors, who now included Shark Catamaran, Mobjack, Thistle, 505, and Sunfish skippers, were hard on the trail of the regatta circuit silver. Monday morning accounts of regatta activities were filled with the names of Broad Bay skippers who had won in their classes. While the One-Designers were busy gathering their silver, the Cruising types were holding informal races in Lynnhaven Roads and forming up cruises to other parts of the Chesapeake Bay. Until 1974-5 there was a very well attended regatta schedule on the lower Chesapeake, with the Broad Bay Regatta being one of the premier events. In 1970 there were 175 boats racing in 14 classes on Broad Bay at one time! All hands turned out to host the skippers, their crews, and their families to two days of racing and a Saturday afternoon picnic/cookout which originally featured oysters and crabs and in the later inflationary years, hot dogs and hamburgers. Gradually the Broad Bay Sailing Association evolved into the current day BBSA, with its racing fleets (Willoughby Bay, Little Creek Sailing Association, and Hobie Fleet 32) and its large contingent of cruisers and day sailors. Big boat racing took on a whole new meaning with sponsorship of the Leo Wardrup Memorial Cape Charles Cup with its 2-day race to Cape Charles and back. Other distance races include the Cape Henry Cup, and Neptune Regatta. A good portion of the BBSA members cruise and race, while others stick to their chosen activity. As the club has grown, we now focus on all types of sailors who want to do what they love best with a congenial group of friends. They also want to know more about sailing, so education and training have become a primary focus in the off months. With an active group of volunteers, we schedule many group cruises during the warmer months with something for everyone. We have members who continue in the group although they may not be sailing any longer or do not have boats. They attend membership meetings, training, events, and are always welcome as crew on the racing boats. All are welcome who share a love of sailing. Check out the Membership page for details on how to join and start having fun.